Mughlai Chawal recipes, Mughlai Biryani recipes, Mughlai Rice recipes. The Mughals liked even their rice to be richly flavoured! And indeed, there is an old world charm to rice dishes like Korma Biryani, Lajjatdar Handi Biryani and Layered Bread Kofta Biryani that employ a lot of spices and methods like handi cooking and cooking in milk to impart a rich flavour and aroma to the rice. Mughlai Chawal Recipes, Mughlai Rice Recipes, Mughlai Pulao recipes. Green pea pulao with paneer koftas is a luxurious Mughlai -style pulao, which is marked not just by the mix-and-match colours of green peas and apricots, but also the splendid paneer koftas that are tossed into the rice! The fragrance of saffron and other spices is really accentuated by the baking procedure. After having seen Mughlai food it is evident that saffron or kesar is a much-loved ingredient that can be used in a number of dishes. Zaffrani Pulao recipe or saffron rice is simply rice prepared with saffron flavouring. Paneer, cashewnuts and raisins make this preparation a rich delicacy that is easy to prepare and that can be cooked up in a jiffy. If minimal ingredients can create a dish worthy of the lords, then this is it! Restaurant-Style Jeera Rice is a flavour-packed rice preparation with the enticing and appetising aroma of jeera. Achari Paneer Pulao recipe is paneer, marinated with achari spices like fennel and nigella is tossed together with rice, which is cooked to perfection with typical spices like cinnamon, cloves, cardamom and caraway. This gives the feeling of having a nice pulao with a mild pickle, but it comes in a single package, making it convenient to serve or pack. Vegetables and lentil puloa is a concoction of rice, dal, mixed veggies, saffron and fried onions, is layered with a rich gravy made with onion paste, and baked in an oven. This is a relatively easy-to-make main course, but the effect is grand because baking creates a ‘dum’ effect in the vegetable and lentil pulao. Mughlai Biryani Recipes. Mughlai Veg Biryani Recipes. A reminder of the opulence of the Nawabs, the Kabuli Chana Kofta Biryani recipe is a royal treat that pampers you with every mouthful! Perfectly cooked long-grained rice is layered with a richly flavoured tomato gravy studded with scrumptious kabuli chana koftas. The gravy, made with tomato puree, masala pastes and spice powders has an intense aroma and deep flavour, which are ideal for the mealy koftas made of soaked and ground kabuli chana. Korma gravies are very popular with most people, thanks to their intense flavour and rich aroma. We present an innovative, layered Korma Biryani made with korma gravy and rice that has been flavoured aesthetically with whole spices and saffron. Handi Biryani is absolutely superior to those made with other methods like open or pressure cooking, even though it appears to use similar ingredients. The simple process of sealing the lid with chapati dough and allowing the ingredients to cook within a covered environment makes all the difference. Biryani is an everlasting relic of the Moghul era that continues to live and breathe in innumerable restaurants and kitchens across the globe. Not only that, this traditional Veg Biryani recipe has stood the test of time by being constantly adapted to suit the tastes of each generation. While many modern versions of this spice-filled rice preparation are made in the oven or microwave, here is a recipe that retains the original Handi cooked magic. 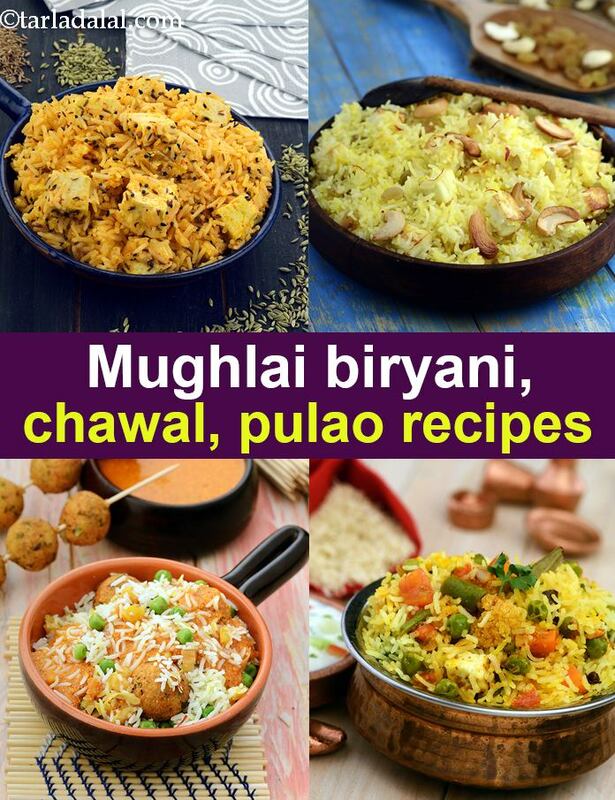 Enjoy our Mughlai Chawal recipes, Mughlai Biryani recipes, Mughlai Rice recipes. and other Mughlai Recipe articles. A concoction of rice, dal, mixed veggies, saffron and fried onions, is layered with a rich gravy made with onion paste, and baked in an oven. This is a relatively easy-to-make main course, but the effect is grand because baking creates a ‘dum’ effect in the vegetable and lentil pulao. Bring rice and fibre-rich masoor together to create a low-cholesterol but infinitely tasty biryani. A special masala, and a thoughtful method of preparation make the masoor biryani a grand fare despite using minimal fat and avoiding unhealthy cooking techniques. You will love the outcome. The pulao tastes lovely when served with yoghurt and coriander chutney.